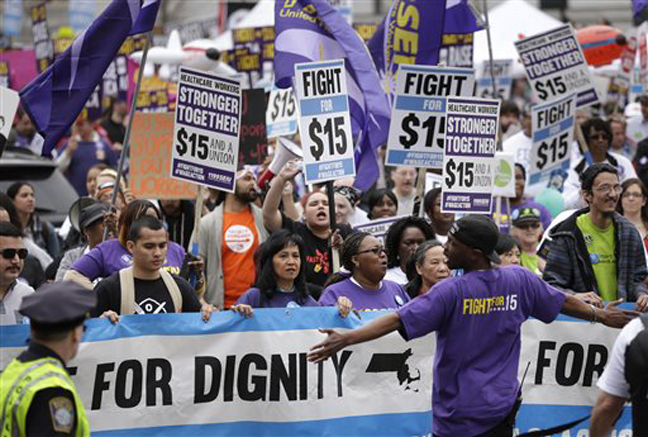 A majority of Los Angeles County voters support raising the minimum wage for home-care workers to $15 an hour, according to a poll released recently by the union representing the workers. The poll, based on a survey of 750 “likely voters” from across all five county supervisor district, found that more than 70 percent of respondents support raising the current hourly wage of $9.65 for In-Home Supportive Services (IHSS) workers. The poll also found that voters believe IHSS workers should not have to rely on government assistance for basic necessities. According to union officials, 81 percent of L.A. County home care workers live in poverty. Wages were last raised to the current $9.65 mark in 2012, when the county approved a 65-cent increase. Members of the Service Employees International Union-United Long Term Care Workers marched through downtown Los Angeles in April as part of a major contract negotiation campaign termed We Care L.A. The county is in the midst of a series of public meetings to discuss the possibility of raising the minimum wage for all workers in the county. The city of Los Angeles is considering a series of options, including one that would raise the wage to $13.25 an hour by 2017 and to $15.25 an hour by 2019.